Trying to find an affordable apartment is almost a full-time job for renters in America’s largest cities. But the housing crisis ranges in severity, depending on which city you consider. In Columbus, Ohio, for example, the average renter spends 28.1% of their income on rent. In New York City that figure is 32%, and in Detroit the average renter spends nearly 37% of income on rent. 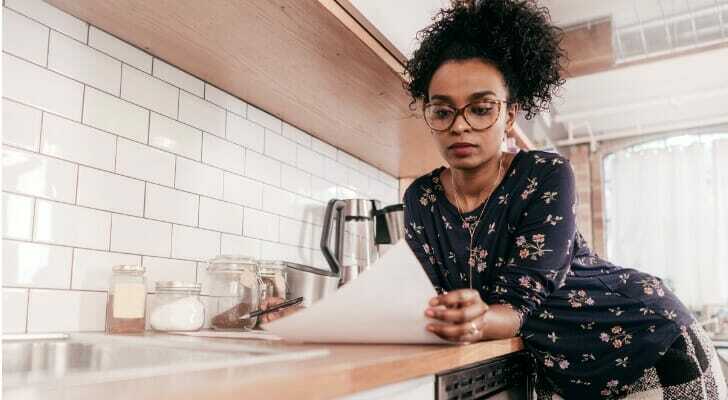 With such a high percentage of income needed to pay for rent, renters are often unable to save up for a down payment and are locked out of the mortgage market. To get a closer look at this issue, SmartAsset analyzed data for two-bedroom apartments in the 25 largest American cities to see where you need the most income to afford rent. Check out the data and methodology section below to see where we got our data and how we put it together to create our ranks. 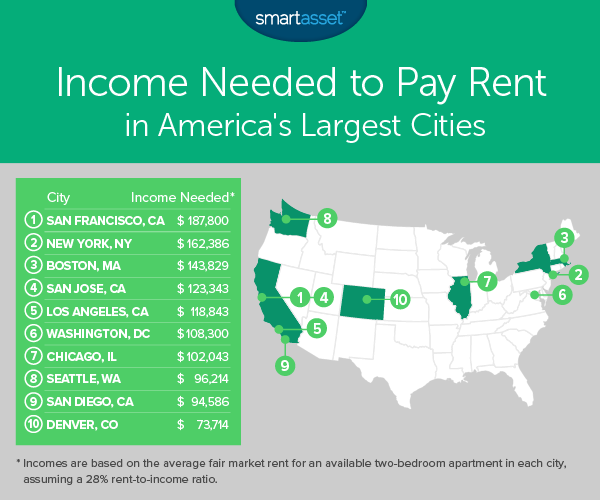 This is SmartAsset’s fourth annual study on the income needed to pay rent in the largest U.S. cities. Check out the 2017 version here. Renting in California’s largest cities is unaffordable – There are four California cities on the list of the nation’s largest 25 cities. All four of them rank in the 10 places where you need the most income to afford rent. 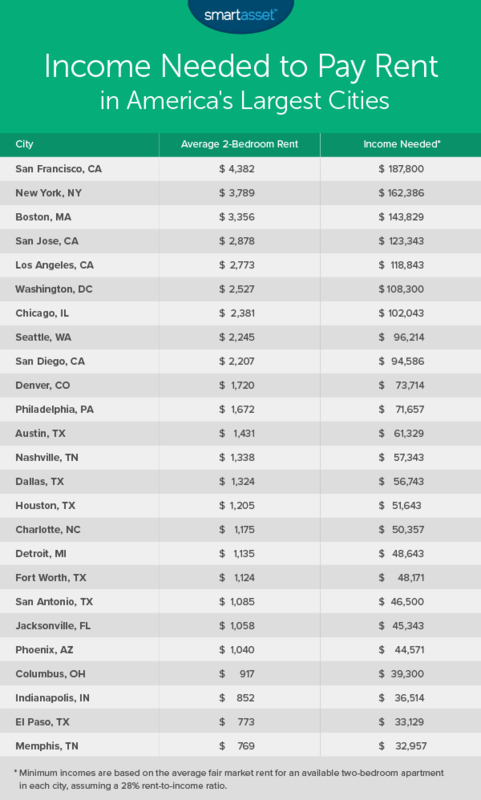 In San Francisco, Los Angeles and San Jose in particular, rent is expensive. The least expensive of these cities in L.A., but we estimate that you’d still need an income of $123,300 to comfortably afford a two-bedroom apartment there. Charlotte offers good value – According to our analysis, in order to afford the average two-bedroom apartment in Charlotte, you need to earn $50,400 per year. The median household income in Charlotte is $61,000, meaning the majority of households can afford a two-bedroom apartment. In total there are 10 cities on our list where the average household can afford to rent the average two-bedroom apartment. It is no surprise that in order to avoid being housing-cost burdened in San Francisco, you need to earn some serious coin. According to our data, the average monthly rent for a two-bedroom apartment in San Francisco is nearly $4,400. That’s roughly $52,600 per year. A San Francisco renter looking to rent the average two-bedroom apartment and avoid being housing cost-burdened will need to earn nearly $188,000 per year. The average household in San Francisco earns $103,801 per year. The Big Apple ranks second. The average rent for a two-bedroom apartment here costs nearly $3,800. We estimate you would need to earn a minimum of $162,400 in order to pay no more than 28% of your income on that rent. If you are looking for more affordable options, Queens or Brooklyn are good boroughs to check out. The average two-bedroom apartment in Brooklyn costs $3,200 and in Queens, it costs $2,660. Boston, the nation’s 22nd-largest city by population takes third. We estimate that to cover rent on the average two-bedroom apartment, which according to our research costs nearly $40,300 per year, a renter will need an income of $143,800. That means paying rent for the average family in Boston will be pretty difficult. Median household income in Boston is only $63,600, according to Census Bureau estimates. The average two-bedroom apartment in San Jose will set you back about $2,900 per month, according to our data. Over the course of the year that means over $34,500 worth of rent payments. If you want to pay for the average two-bedroom apartment in San Jose and avoid being housing cost-burdened, you will need to earn over $123,300 per year. That figure is only 21% higher than the San Jose median household income. In fifth is the City of Angels. We estimate that in order to afford the average two-bedroom apartment, which costs $33,300 per year, you would need to have an annual income of $118,800. That is a number the vast majority of Los Angeles households would be unable to meet. The median household income in L.A. is $54,400. The lack of affordable housing is such a big problem in L.A. that over 281,000 of the 884,000 renting households spend at least 50% of their income on rent. The nation’s capital is another city where residents need to earn six figures to afford the average two-bedroom apartment. Our data shows that on a monthly basis the average two-bedroom apartment costs $2,500. Over a year, those rent payments will equal roughly $30,300. To afford that and not be housing-cost burdened, we estimate you would need to earn $108,300 per year. Census Bureau data shows that over 45% of Washington, D.C. renters spend at least 30% of their income on rent. The Windy City takes seventh. The average two-bedroom apartment here can be yours for just under $2,400 per month. To afford it, we estimate you will need a household income just over $102,000, assuming you want to spend no more than 28% of your income on housing. Census Bureau data shows the average household in Chicago would struggle to make rent on the average two-bedroom apartment. The median household income in Chicago is only $53,000. Rent in Seattle is slightly higher than last year when we ran these numbers. Last year, we estimated you needed to earn just under $86,800 per year to afford the average two-bedroom apartment. This year, RentCafe data shows that rent is up about $200 per month. With the updated rent data, we now estimate you would need a household income of $96,200 to afford the average two-bedroom apartment in Seattle. Fortunately, with a median household income of $83,500, many Seattle residents are able to afford the average two-bedroom apartment. San Diego is a newcomer to this list as we did not consider them in last year’s analysis. To comfortably afford the average two-bedroom apartment in San Diego – which costs $26,500 per year – we estimate you need have a household income of $94,600. Overall 68,500 of the 269,200 renters in San Diego spend at least 50% of their income on rent. This shows that many residents are unable to find affordable housing. The Mile High City takes the last spot in the top 10. A two-bedroom apartment in this city is reasonably affordable compared to local incomes. Our data shows the average two-bedroom rental in Denver costs $1,720 per month, or $20,600 per year. To afford that while avoiding being housing-cost burdened, we estimate you need to earn $73,700 per year. That figure is only $12,600 more than the local median household income. In order to find the income needed to pay rent in America’s largest cities, we looked at data on the 25 largest cities in America. Specifically, we estimated the amount of income a renter would need to afford the average two-bedroom apartment while paying no more than 28% of their income. To find this number, we divided the average annual cost of a two-bedroom apartment by 0.28. This resulting figure was the annual income required for rent costs to equal 28% of income. We then ranked the cities from highest to lowest based on this figure. Data for average two-bedroom rent comes from RentCafe.com and is for June 2018. Buy or rent? – When you’re moving to a new city, you need to decide if you are going to rent or buy. If you are coming to a city and plan to stay for the long haul, buying may be the better option for you. On the other hand, if your stop in a new city will be a short one, you’ll likely want to rent. Watch out for the extras – The mortgage payment is typically the most expensive part of homeownership. However, there are other costs to consider, like property taxes. Depending on which state you live in property taxes can be more or less burdensome. Average property tax rates in Louisiana, for example, are much lower than average property tax rates in Texas. Get an expert’s opinion – Knowing when to buy a home, or how much home you can afford or whether it even makes financial sense to buy a home are all complicated decisions to make. If you are not 100% sure of what the best financial move for you is, you should consider talking to a financial advisor. SmartAsset’s financial advisor matching tool can help you find an advisor in your area. It will match you with up to three local financial advisors who meet your specific requirements.